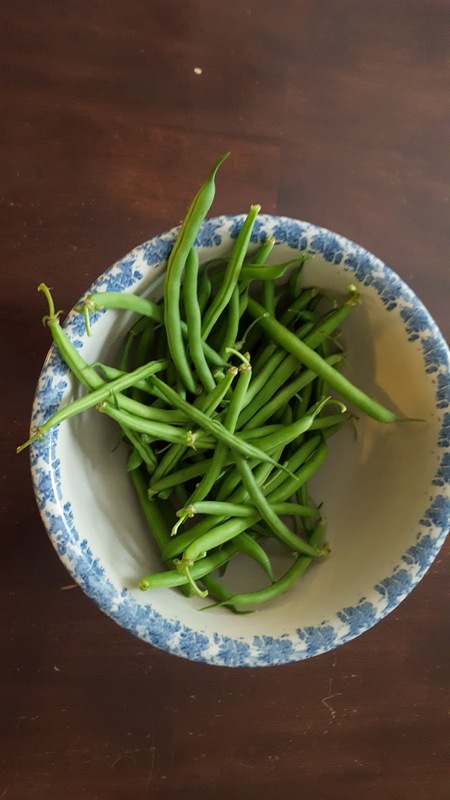 As soon as the green beans are ready to be picked off the plant, after ferreting them out from under the shady leaves, even if I only have a handful, this is the first recipe I want to make. 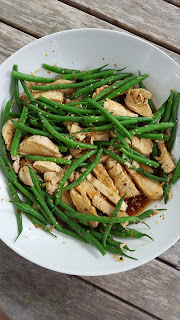 I whip up this warm chicken salad and serve it over rice for a light summer dinner then eat the leftovers cold (if there are any) for lunch the next day, the flavors completely absorbed into the chicken and clinging to every last green bean. I first made Val's version of "Warm Chicken Salad with Green Beans" for tailgating at one of those long triple billing, marathon afternoon into evening summer concerts that only 20 somethings and aging hippies seem to be into. It was not a fancy affair with grills, gourmet spreads, lounge chairs and RV's like you now see on the Cooking Channel during the height of football season. This was an event better described by dusty bare feet, ratty old concert T's, loads of bad tattoos and warm cans of Bud Light. It was a hot July day when we headed off to Great Woods, a concert venue that was an open stadium with a big dirt hill, the grass having worn away a long time ago, that served as the "bleacher" seats. The idea was to spread out a blanket, bring a few lawn chairs, buy some over priced warm draft beers and enjoy a day into night of music under the sun and stars. If you could make it that long before passing out from heat stroke, inebriation, or both. But my roommate, Sarah and my then boyfriend, Rob had our own plans. We knew that we would never last the entire day full of guitar jamming no name bands in order to see the headliners later that evening. This was not our first time heading into hippie concert land. Instead, we packed up our own ice cold bottles of Miller Light (high end for us at the time). I made a double batch of this salad and tossed it in the cooler. Upon arrival, we popped open the trunk of Rob's black Chevy Cavalier, sat on the bumper and indulged, dunking wedges of pita into the soy and sesame juices and scooping up chunks of marinated chicken and crisp green beans with the bread since I didn't think to bring any forks. Then we washed it all down with our contraband beers. In the distance, we could hear a few opening acts as the guitar riffs floated through the air while we kept track of where the band was in the line-up and relaxed in the parking lot. Finally, when we couldn't hold it another minute, Sarah and I entered the madness of the venue to use the bathroom that had by now turned into a swamp. Barefoot treehugger girls wearing maxi dresses that dragged in the dirt trudged through the filthy facility. Sarah and I knew better. Work boots and denim shorts may be a fashion faux pas for most events but at least our outfit choice kept our feet protected from the muddy cement floor in the ladies' room. After the bathroom adventure and locating Rob again amidst the crowds swaying to the deafening music, we managed somehow to sneak into the covered (more civilized) pavilion seats up in front of the stage. During the last set of the show, just as eardrums couldn't take it anymore, we dragged ourselves back to the car for the last of the now semi cold beer and the remaining chicken salad. We slurped up what was left, wishing there was more, dying for a late night snack before we headed out to wait in the long line of cars and buses trying to leave the parking lot and head home. It's been a longer time than I would like to admit since those concert days. Now, when I pack up snacks, I usually remember to bring a fork so I don't have to use my fingers. I pull the Tupperware container with the ice cold salad leftovers out of my beach cooler and relax with my feet in the sand while I savor every bite. Instead of the thumping of a rock band, I listen to the waves lapping the shore and the noise of my children's laughter as I watch them jump off the dingy dock, playing a made up game with their friends. But one thing will never change. This tangy, salty, spicy and sweet marinade over fresh green beans and poached chicken really does go great with an ice cold beer. Meanwhile, wash and pick green beans by removing the stems. If they are long, snap them in half. Prepare an ice bath in a large bowl. Blanch beans in boiling waiter for 1-2 minutes until they turn bright green. Drain immediately and plunge beans into the ice water bath to stop the cooking process. Let rest for 5 minutes and drain thoroughly. *Mix the dressing: combine celery seed through vinegar. Add honey and whisk to combine. Slowly add oil while whisking. Add sesame seeds and mix thoroughly. Place sliced chicken and green beans in a large shallow bowl or baking dish. Pour dressing over ingredients and toss to coat. **Serve warm or at room temperature. *I double the amount of dressing because I like a lot of sauce! **Serve with rice for a satisfying dinner.